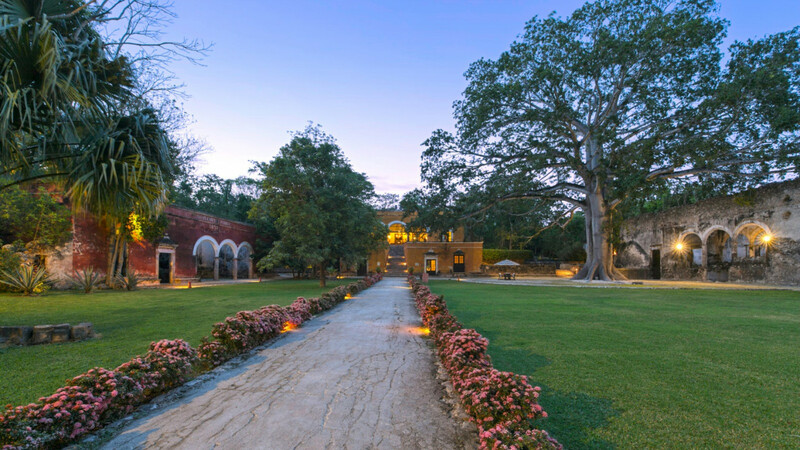 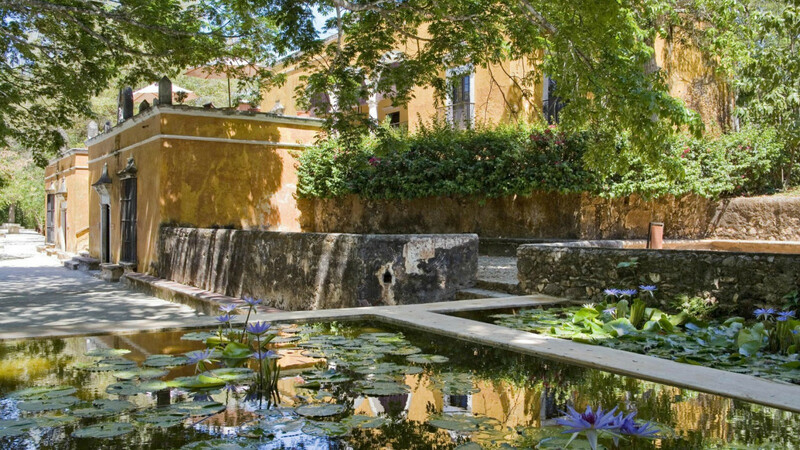 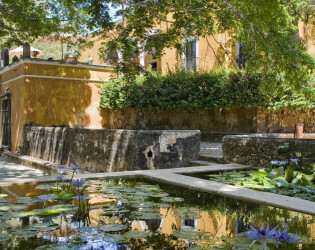 Built in 1700, Hacienda Uayamon reflects the sophistication of a luxury resort with attention to surrounding natural beauty. 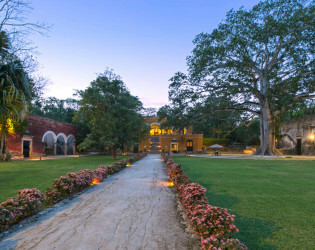 With superior service and accommodations, this unique hotel has been awarded by the well-known magazine Travel & Leisure in the Global Vision Awards 2010 in the category "artisan revival." 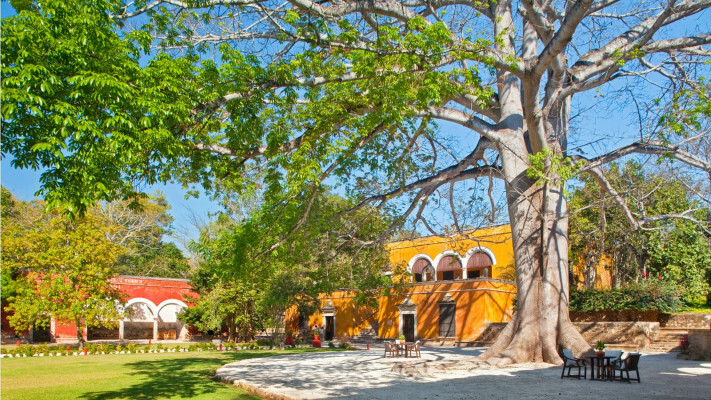 Built in 1700, Hacienda Uayamon reflects the sophistication of a luxury resort with attention to surrounding natural beauty. 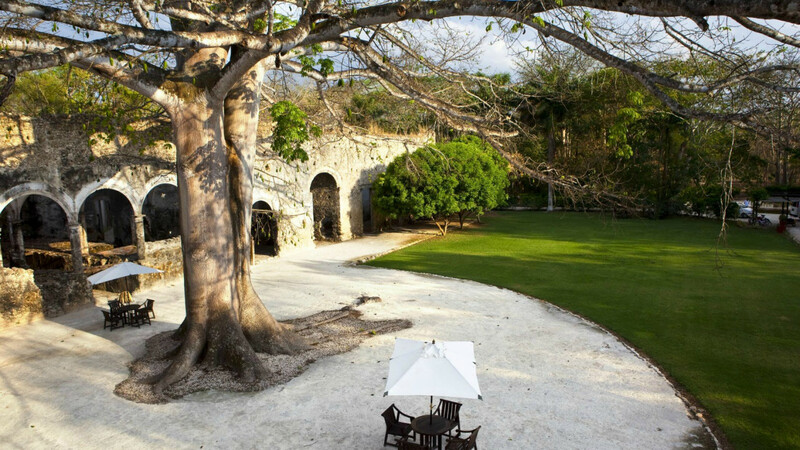 Walk through our candlelit private gardens amongst the whistling frogs or discover Edzna, a historical Mayan site. 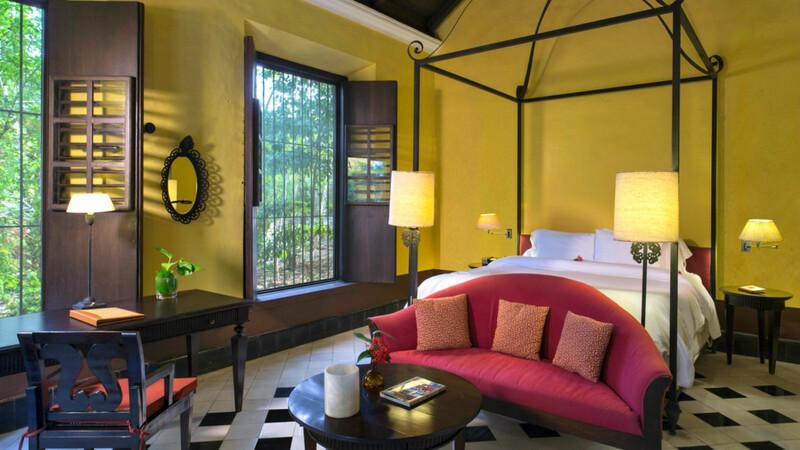 With superior service and accommodations, this unique hotel has been awarded by the well-known magazine Travel & Leisure in the Global Vision Awards 2010 in the category "artisan revival." 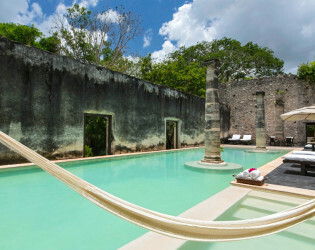 Indulge in the soothing waters of our outdoor pool and sink into our cotton woven hammocks over crystal waters for a mid-afternoon nap. 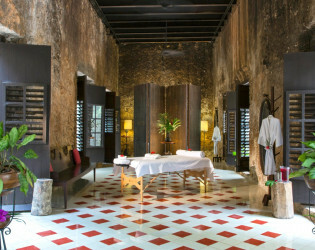 For a luxurious, world-class experience, renew your spirit at the spa amongst graceful tulle netting, pristine massage beds, and aromatherapy candles. 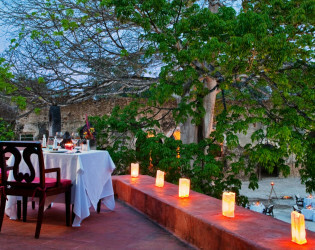 For an evening of elegance and international cuisine, Uayamon Restaurant provides a candlelit atmosphere amongst traditional hacienda walls with fresh-baked bread and creative dishes prepared using fresh, indigenous ingredients. 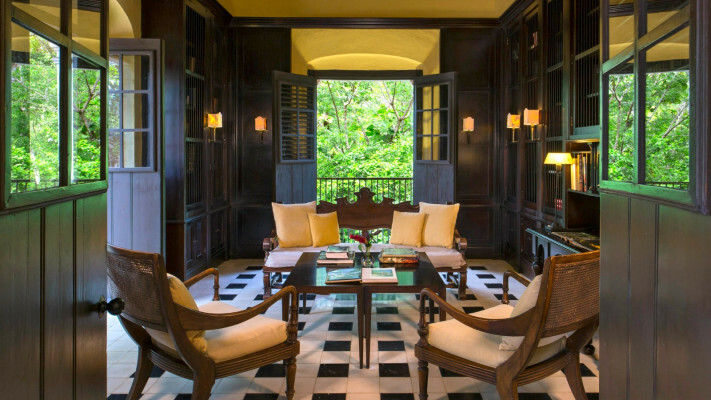 Our villas and suites have been fully restored and adapted to today's needs. 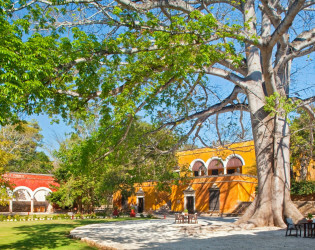 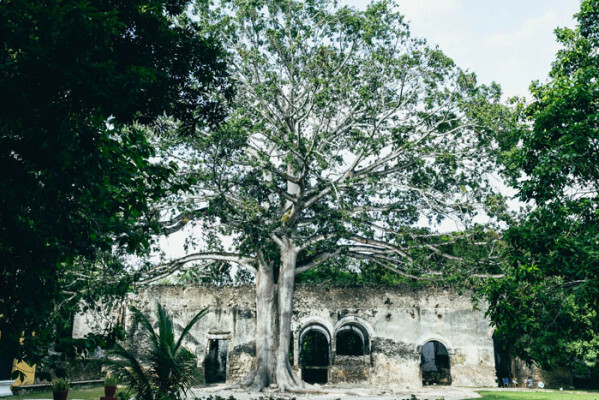 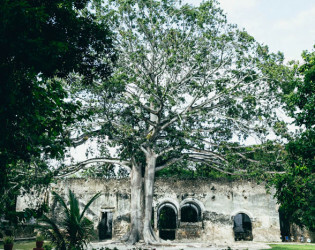 A specific restoration project worked to maintain the Hacienda's particular architectural personality by conserving the same spirit that its former owners gave to it. 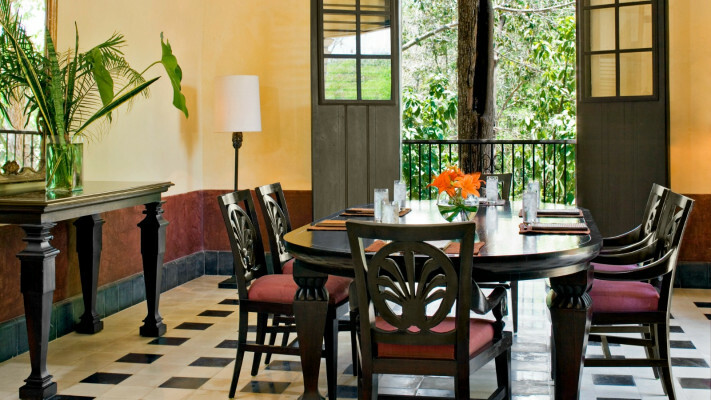 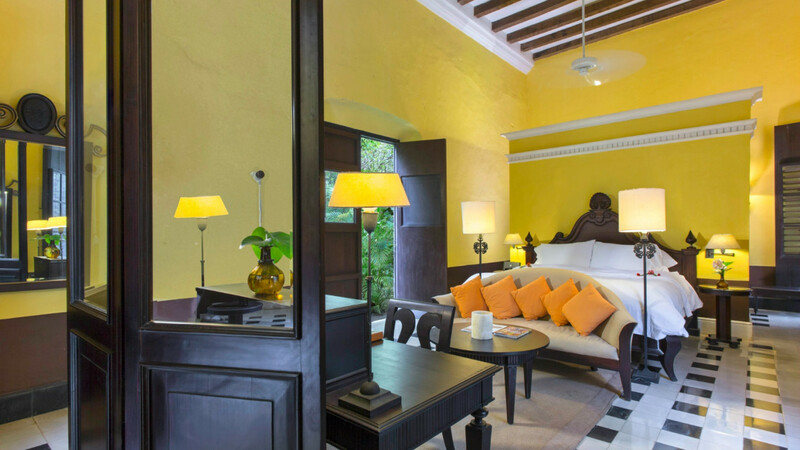 Thus, in some cases, the restoration brings together contemporary and traditional aspects, allowing the new spaces to highlight the artistic and architectural value of the Hacienda's original features. 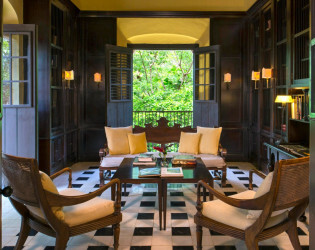 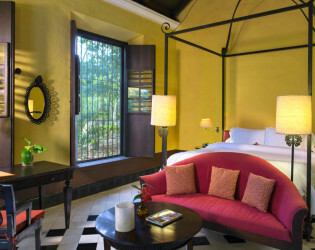 The Indonesian architect, Jaya Ibrahim, designed the guest rooms and public areas, giving our Hacienda a very unique touch. 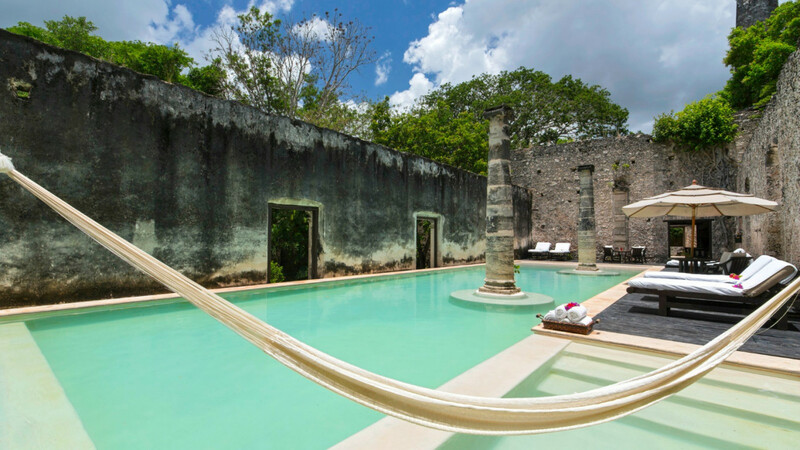 Large, bulbous pegs in the guest room's stonewalls hold the woven cotton hammocks, for which Yucatan is famous, allowing you to sleep in the Mayan style. 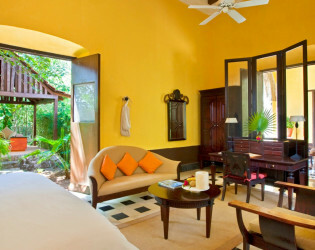 Some of the services above could have additional charges and cannot be avaliable 24-hour. 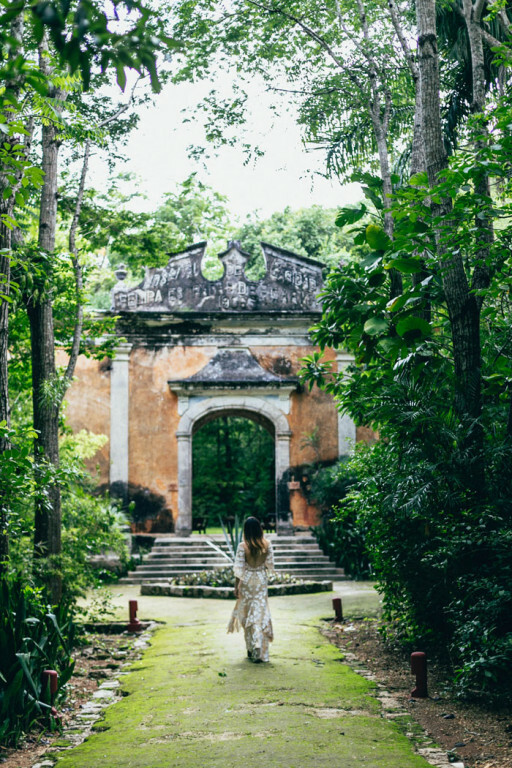 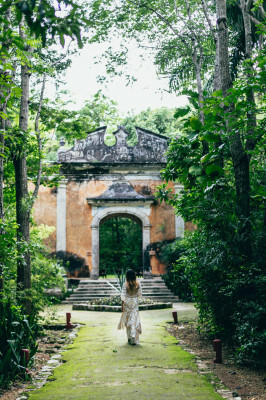 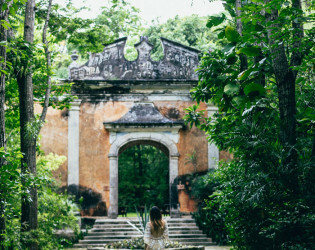 For those who are looking for a mystic, energizing and peaceful location, Hacienda Uayamon is the ideal option each wedding has its own signature, style and feeling. 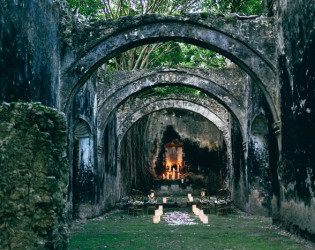 Get married in the chapel in ruins, host a rehearsal dinner in a terrace with a view to the jungle, sleep the first day as a newlywed couple in a more than 350 years old room. 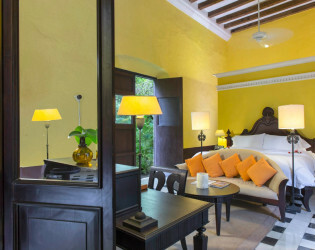 Unique details like these are what make this Hacienda exceptional. 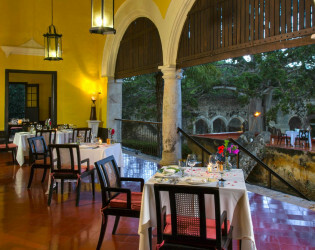 Uayamon Restaurant is located in the original main building of the hacienda. 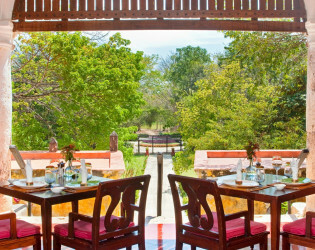 It features a closed, air-conditioned area, but we will be more than pleased to prepare your table in the areas surrounding the restaurant if you so request. 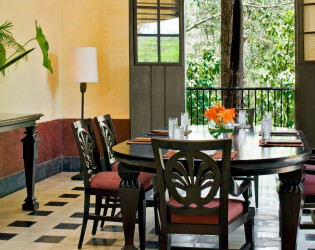 The menu proposes a blend of regional and international cuisine. 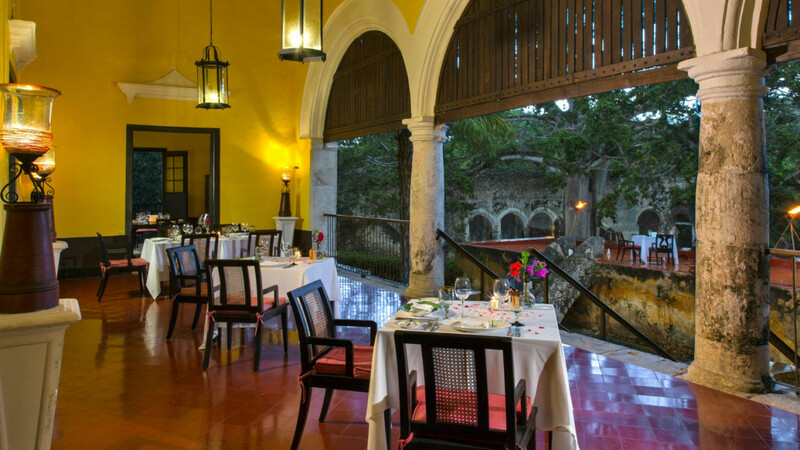 Our chef combines the culinary delights of a typical Campechean kitchen with the mouth-watering mixture of European and Mexican flavors. 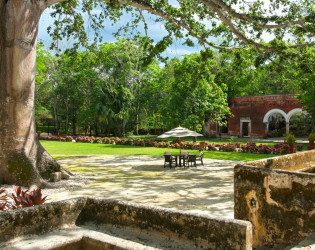 Most of the ingredients are organic and come from the hacienda's gardens. 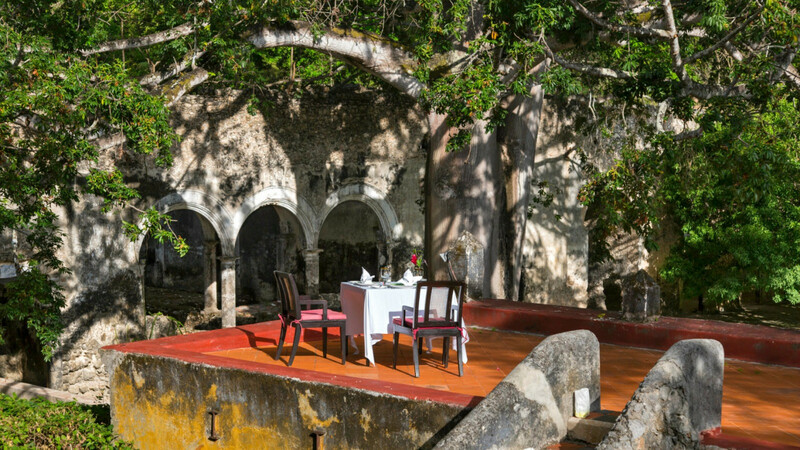 Fresh-baked bread is "made at the hacienda" and local fishermen bring fresh fish in daily. 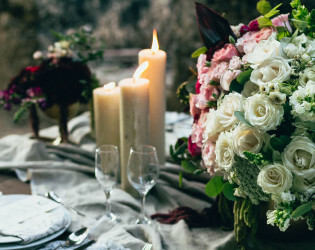 In your heart, no matter the life around you, there keeps a passionate hope to be swept into an epic romance — a daring affair of the old world, all candlelit and serene. 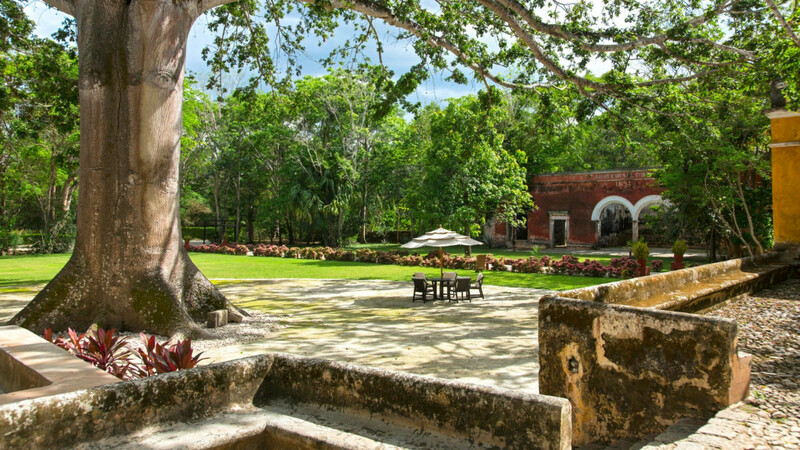 Well, as luck would have it, the folks at Hacienda Uayamon cordially invite you to wholeheartedly disappear from the modern age by escaping to their timeless oasis on the Yucatán Peninsula. 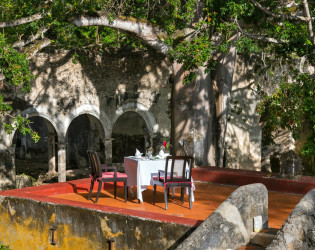 At this breezy daydream of artisan revival, the walls keep their centuries-old history and guests instantaneously abandon all stress. 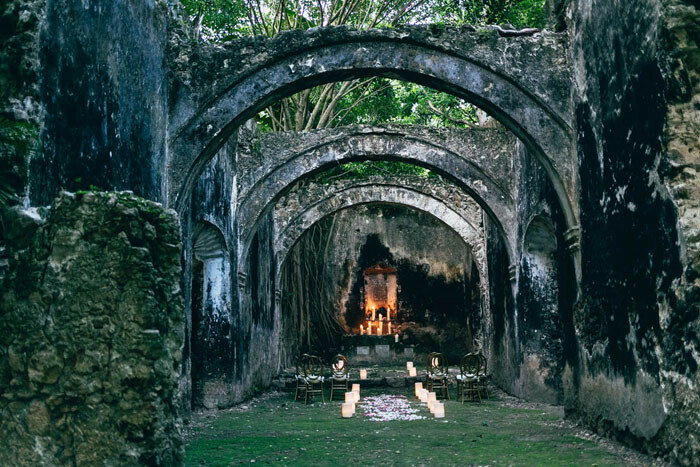 Deep, rich colors adorn everything from flooring to furniture, in contrast to the mystical ruins that weave throughout, while an enchanting jungle landscape surrounds and practically pours in through the open doors and windows. It’s as much an escape for young spirited newlyweds as it is a Hemingway type in search of novel inspiration. 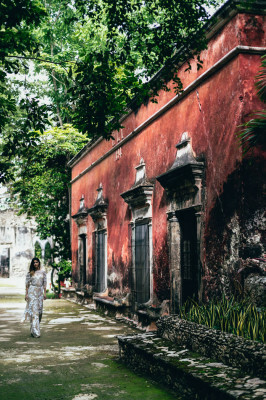 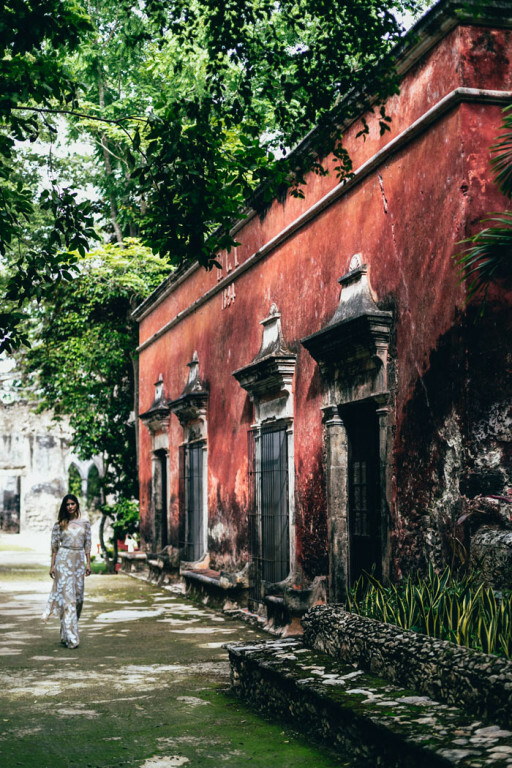 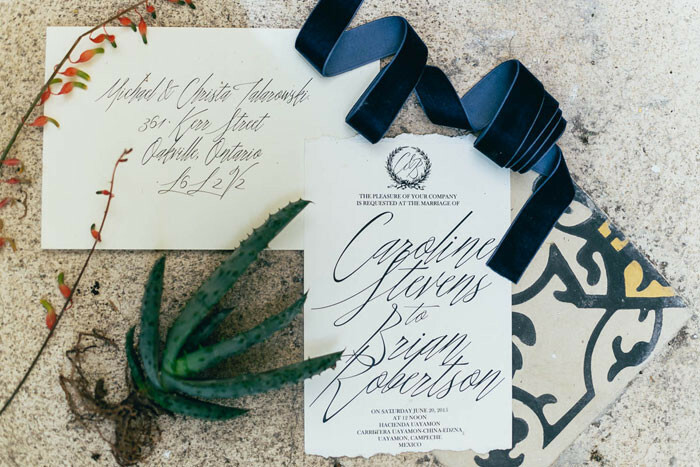 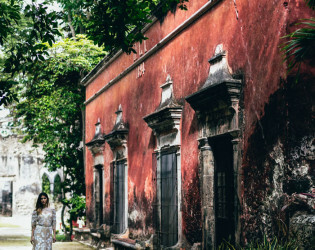 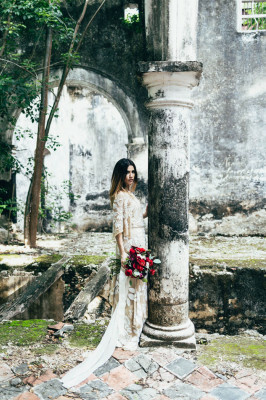 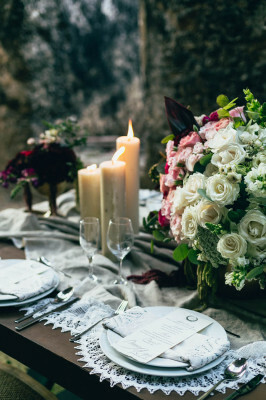 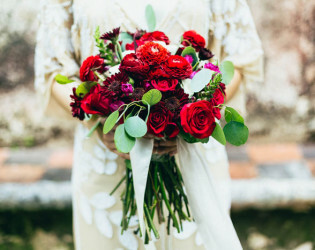 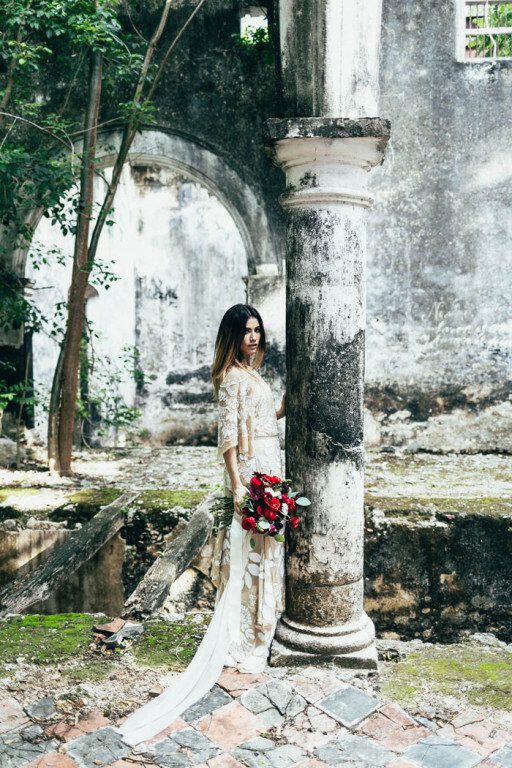 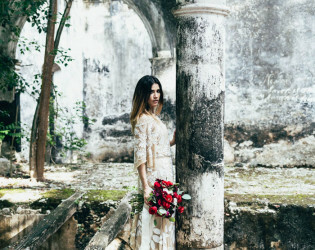 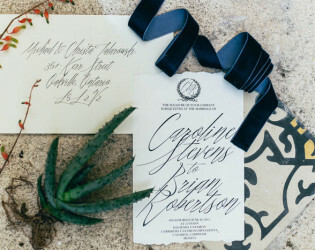 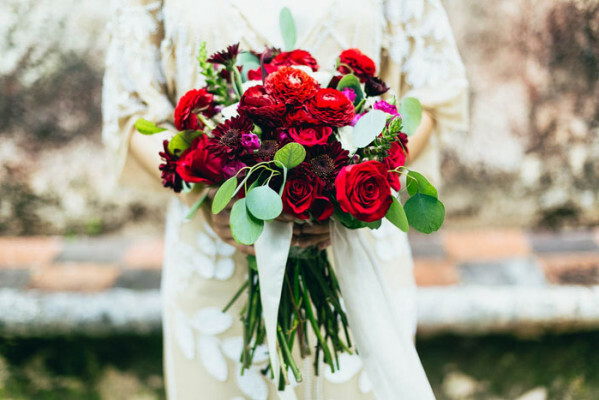 So, with us beyond intrigued, we sat down with event planner Mahla Pourshamsa of The Eventeur Inc., to talk about this stunning photoshoot she planned with The Love Studio who shot this magnificent Mexican idyll. 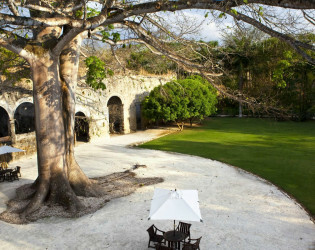 Walk through our candlelit private gardens amongst the whistling frogs or discover Edzna, a historical Mayan site. 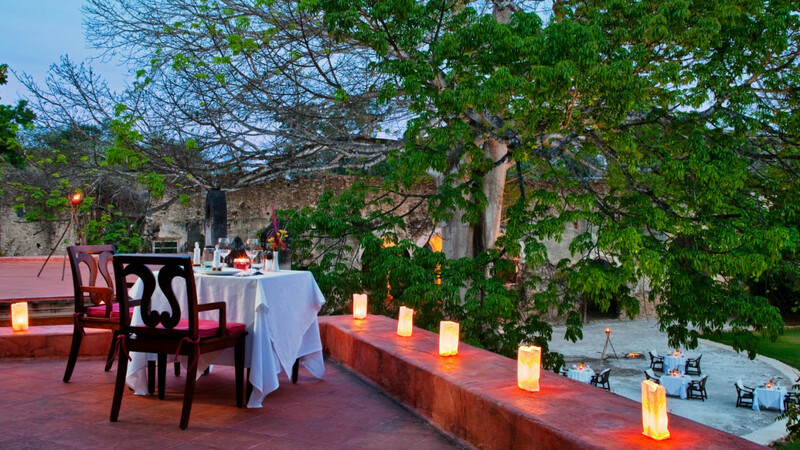 Enjoy the beautiful view while enjoying a delicious meal. 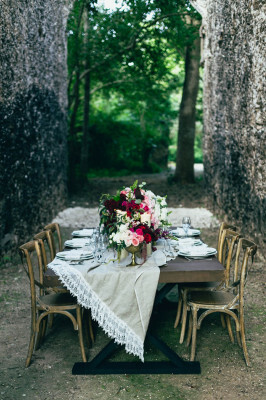 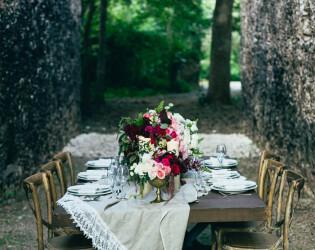 Outdoor ceremony and reception spaces. 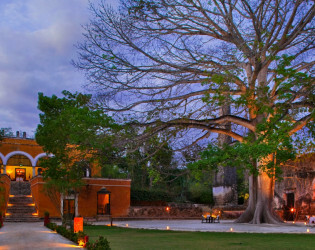 With superior service and accommodations, this unique hotel has been awardered by the well-known magazine Travel & Leisure in the Global Vision Awards 2010 in the category "artisan revival." 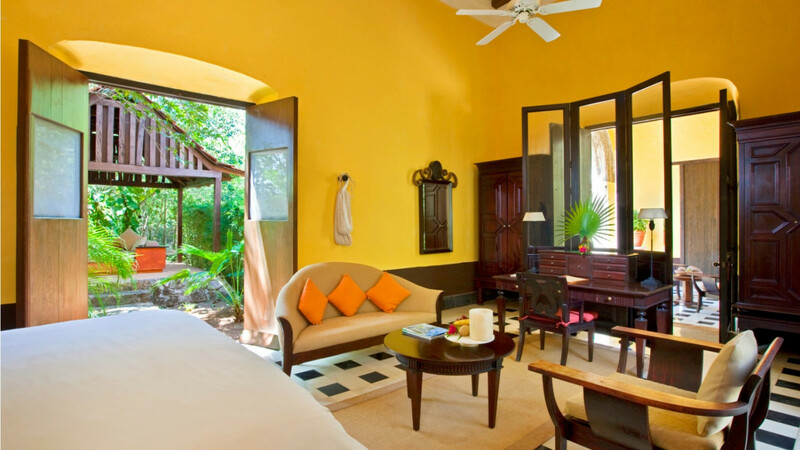 Our villas and suites have been fully restored and adapted to today's needs. Get married in the chapel in ruins, host a rehearsal dinner in a terrace with a view to the jungle, sleep the first day as a newlywed couple in a more than 350 years old room. Our chef combines the culinary delights of a typical Campechean kitchen with the mouth-watering mixture of European and Mexican flavors. 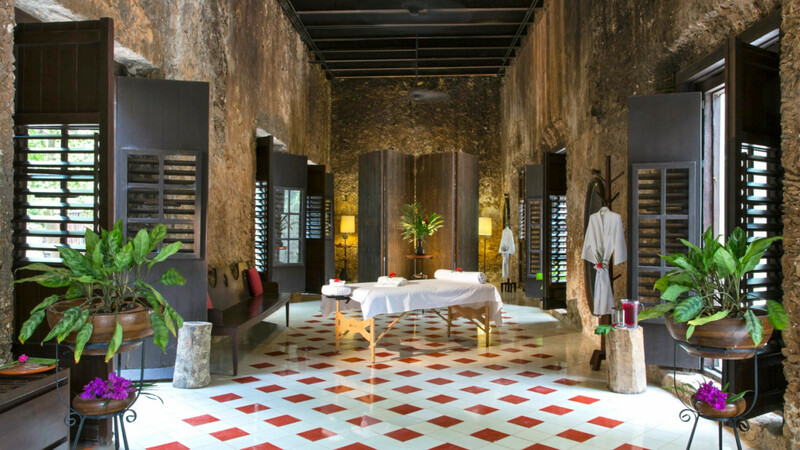 For a luxurious, world-class experience, renew your spirit at the spa amongst graceful tulle netting, pristine massage beds, and aromatherapy candles. 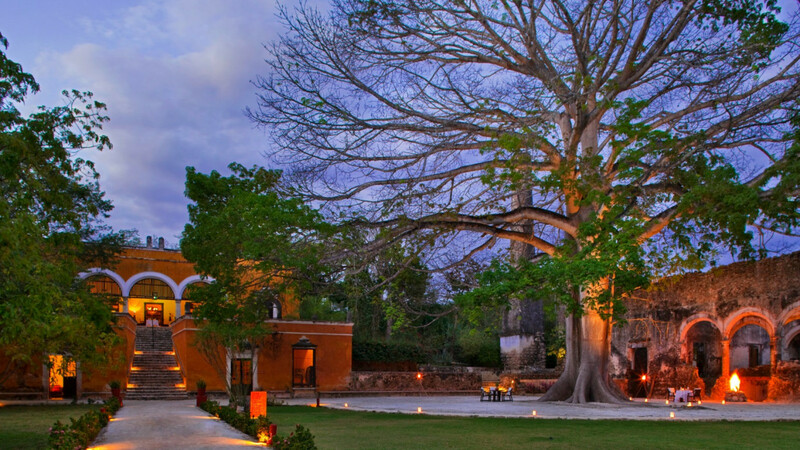 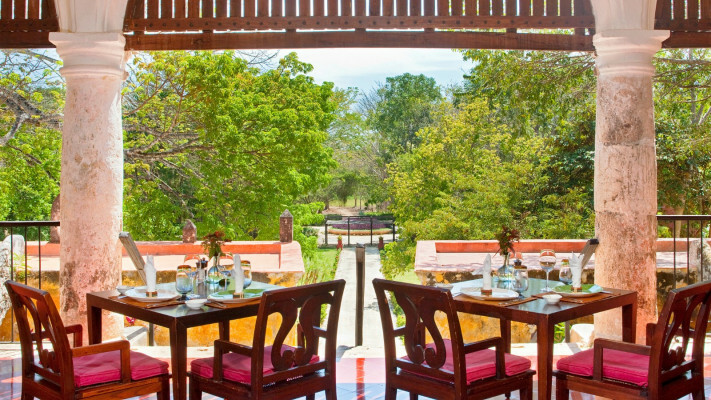 Uayamon Restaurant is located in the original main building of the hacienda. For an evening of elegance and international cuisine, Uayamon Restaurant provides a candlelit atmosphere amongst traditional hacienda walls with fresh-baked bread and creative dishes prepared using fresh, indigenous ingredients.